Storing a classic car in a self-storage facility such as Vines Storage in Redlands is a wonderful way to keep your classic car protected. However, in order to keep your classic car in great condition when storing for the long-term, there are some tips you should keep in mind to ensure the protection of your beauty! An inactive car can cause develop a number of problems. Batteries can die, your brakes can lock up, metal may rust, and the rubber can rot. By taking good care of your vehicle, you can easily store it and keep it in great shape with these car storage tips! Before putting the car away for the winter (or any other long-term storage), it is essential that you give the car a great overall detailing. Make sure the car is clean, waxed, and vacuumed out. It is also a good idea to lubricate the rubber to ensure it doesn't rot or dry, and give any leather interiors a good conditioning. If you want a gorgeous car to come out of storage, you'll want to ensure it is clean when it goes in! If you plan to keep the car stored for a long period of time (about six months or longer, or over the course of a season), then you want to address all of the fluids in the car. Drain the cooling system, fuel tank, change the oil, and bleed the brakes. Making sure fluids are drained or changed before storage will keep internal damage from occurring to the vehicle. Make sure areas of importance are greased accordingly, such as the steering, suspension, and wheel bearings. It is essential that you cover your classic car to protect the paint and wax, and keep any debris out of the vehicle. 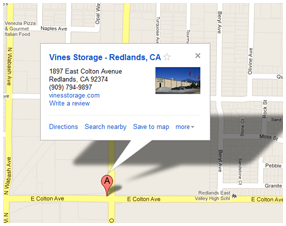 If you are in the Redlands area and using Vines Storage for indoor car storage, you will not need to worry about the elements. However, protecting your car with a cover during long-term storage is always a great idea. These are just a few helpful tips to help you get started properly storing your car for the long haul!